If you’re already onboard with bringing in a professional for your kitchen remodel, where do you go from there? Follow our advice below to get started on planning your kitchen remodel project and making sure it goes smoothly from start to finish. Knowing your needs is key. This photo features the largest island we've ever built, in Cottage Grove, Wisconsin. The clients knew their goal for seating space and it was used to define the island size. Analyze your current kitchen. Make a list of exactly what you’re looking for in a kitchen remodel. Is your kitchen operational but in dire need of an update to the finishes? Do you want a soup-to-nuts demolition and total rework of the room? Do you want more space? More storage? Better light? Better style? If you don’t think much about how you use your kitchen, now is the time to dive down. How many chefs are usually working in your kitchen? How many people are they cooking for? Do you entertain regularly or only at the holidays? Do you use your kitchen for anything besides cooking — is it a gathering hub, a workspace, or anything else? How important is easy cleanup? Make a list of your remodel goals and organize it from “must have” to “in our dreams.” Do some research on how those goals might be implemented. Check out your friends’ kitchens and kitchen design ideas from magazines of the internet. Start keeping a folder of pictures of rooms, products, materials, and architectural details that appeal to you, and show it to your design-build remodelers. This is also the time to establish a firm budget. It’s essential for both you and your design-build team to know from the start how much you are working with. Their vast experience and know-how will be able to stretch your dollars as far as they possibly go. These clients knew that they did not need seating at their island. Instead, we were able to create a small island with cabinetry facing both the sink and the walkway. This ensured that the walkways were unobstructed. In addition to stretching the budget, a design-build team will use their knowledge and experience to identify and anticipate potential issues within your wish-list. They may point out unforeseen problems with your dream materials, or they may suggest options you’d never considered. The most important thing is that your design-build team will help balance beauty and functionality in your kitchen to create the best possible outcome — and the advantage of a design-build team is that you’ll be working with the same people from draft to completion. There’s no hand-off from an architect to an unfamiliar contractor that could create miscommunication and issues. A design-build remodeling firm has the expertise to take you through every step of the kitchen remodeling process. It’s important to stay in good communication with your design-build team during kitchen remodeling. Work with them to settle on a timeline and number of draft plans — no good designer expects to realize your vision on the first try. Having a timeline for the work will help shore up everyone's expectations, although extenuating circumstances can throw even the best-planned jobs off-track sometimes. Once the contractors are working, try to keep changes to the plan to a minimum, as they can both delay the job and dent your wallet. However, if something must be changed for your long-term happiness, it’s better to speak up. Our final tip… be patient. Planning your dream kitchen — and bringing it to life — takes time. The last thing you want is a rush job. 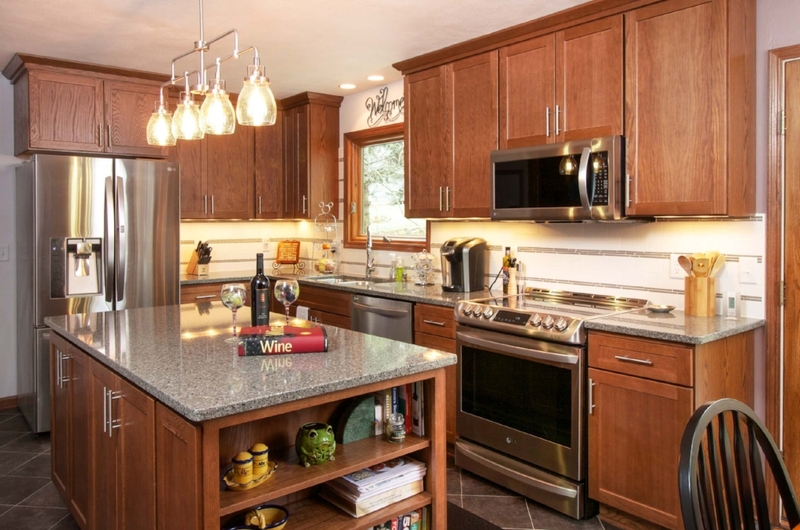 Your design-build remodel team understands better than anyone how important your kitchen remodel is to you and will work with you to make everything happen as soon as possible. But with our experience, we can tell you that putting in the time and effort, in the beginning, makes your kitchen better in the end. Learn about how we make this happen using Our Proven Process for Your Successful Project.